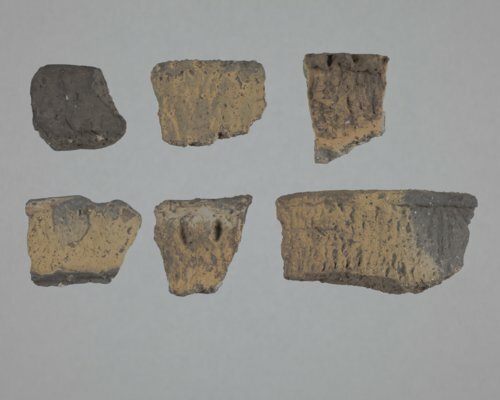 These six rim sherds were collected from the Wullscheleger site in Marshall County and donated to the Kansas Historical Society in 1961. All of the rim sherds have a cord-marked surface treatment and some have decoration at the lip. The clay was folded over at the lip during manufacture to create a thicker rim, called a collared rim, similar to a collar on a shirt. The site was occupied periodically throughout the Early, Middle and Late Ceramic periods.